So how is your football team doing so far this year? Well that's good! Or aw, that's bad! Now that we have the small talk out of the way, on to business. Not actual business, since I get no money, don't have to worry about overhead, profit margins and all that wonderful stuff that goes with owning a business. I would imagine owning your own business would be difficult, especially in this economy. Seeing as how this is a Mariners blog and not part of a lecture on economics, I digress. News, news and more news! Which of those, only the first two are correct. Two items of interest and the third "news" is a lie. I apologize for lying to you right off the bat. First impressions are lasting ones, but let's start over, shall we? The Seattle Mariners hired a new hitting coach and are searching for a permanent fixture in the booth to sit beside Rick Rizzs and talk about baseball a lot. Rick Rizzs will be a part of the hiring process along with a few other big wigs in the Mariners machine that isn't really a machine. Personally, Ken Levine and Mike Curto are my top two choices. I enjoyed listening to both of them in their limited time as part time announcers and I think either one would do an excellent job. If you'd like to cast a meaningless vote and read what Larry Stone had to say, click here and read to your heart's content. I'm not sure who anybody else would vote for, but I'd stuff the ballot box with a write in, if they had that option. Also, I'm fairly certain it doesn't matter who wins the poll. It's just for funsies! The Mariners are expected to announce the new announcer by January. See what I did there, with the announce and announcer bit? I tried to....never mind. It's possible they'll announce it sooner if they decide they've found the guy for the job, but they have until March-ish to get one set and ready to go for the later spring training games. In case you're curious, Ken Levine is leading the poll on Stone's blog by a fairly comfortable margin. The other news of the weekend was the Mariners hiring a new hitting coach. A male human being as a matter of fact. He shall be called Dave Hansen. He apparently played for the Mariners from 2004-2005, but I'll be honest, I don't remember the guy. Not surprising since his last year was 2005 at the age of 35 and did about what Chone Figgins has done, only prettier and less malicious I imagine. There's not really a whole lot to be said about hitting coaches period, let alone a new one that's never been with the team before. 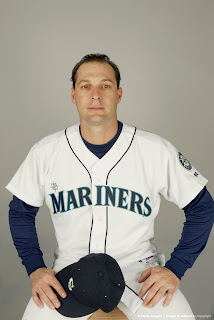 His most recent stint ended after this past season with the Dodgers, allowing him to be hired by the Mariners. I'm assuming he's never seen the Mariners play. Why else would a hitting coach think it was such a grand idea? Then again, I'm sure they get paid more than I do, so who can blame the guy?